For the woefully uninformed: during a press conference early yesterday, Sony's Japanese arm unveiled a new PS Vita model--to be called the PS Vita 2000--as well as something known as the PS Vita TV. The former will be 20 percent thinner and 15 percent lighter than the original PS Vita, according to the chaps at tinycartridge.com. Oh, and it'll ditch the first model's much-slobbered-over OLED screen in favor of an LCD one while bumping up the handheld's battery life by an hour and built-in memory to a full gigabyte. The PS Vita TV, on the other hand, is a screen-less, button-less Vita that, when plugged into your favorite TV, with allow you to play most of the same games a regular Vita can--from (some) physical Vita carts to digital Vita, PSP and PSone titles--using a PS3 controller. There's more to both systems than what I've just mentioned, of course--such as the PS Vita 2000 (pictured below) will hit the streets of Japan on Oct. 10 and will cost about $190, while the PS Vita TV will be released in that region on Nov. 14 carrying a price tag of approximately $100--but I don't really feel like going into all of that here. If you'd like to know more, though, may I recommend clicking here (for an official press release about the PS Vita 2000) or here (for a press release about the PS Vita TV)? No, what I want to do here is talk about my interest in both of these systems. Does that mean I'm going to buy one or both of them in the end? Of course not, but I'm definitely considering it. It shouldn't be much of a surprise to hear that I'm intrigued by the PS Vita 2000, of course, as I've mentioned on many occasions that I'd like to own a Vita and a number of its games at some point. That said, there's only two reasons I'd pick up a PS Vita 2000 over the original model at this point: the former's lower price, and the fact that it's available (or will be in Japan) in pink. Unlike most folks, I don't much care if my future Vita system has an OLED screen or an LED one, so that trade-off (some would say downgrade) doesn't bother me in the least. 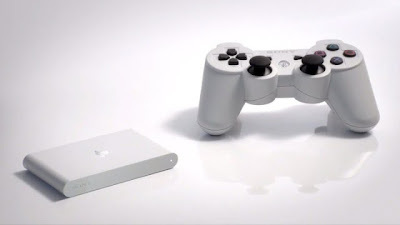 As for the oddly named PS Vita TV (pictured below): the interest there is that it's an appealingly sleek--and tiny--system that would allow me to play certain PSP and Vita games on my not-at-all-high-end television using an actual controller. The last bit of that sentence is a bigger deal for me than you may think, as my hands have been all but tortured by the PSP's d-pad and analog nub while playing much-loved games like Cladun: This is an RPG, Hot Shots Tennis: Get a Grip and Patchwork Heroes over the last few years. If I were to guess, I'd say that it's far more likely that I'll pick up a Vita of some sort than a PS Vita TV, but it's hard to say for sure at this point in time. How about all of you? Were any of you wowed by the PS Vita 2000 or the PS Vita TV to the point that you can see yourself buying one or both of them in the near or distant future? If so, what aspects or features make you feel that way? And if you weren't blown away by Sony's latest announcements, what was it that disappointed--or bored--you? The feature that would convince me to buy a Vita TV is allowing me to use my Vita as a controller for what I'm doing on the television. It seems like a pretty glaring omission to me. Otherwise, I'm intrigued by the product and could see myself buying one. I often used my PSP Go as a "microconsole" by using a PS3 controller to play my PSP and PS1 games on the big screen, so I know how handy that can be. I mostly want that 64GB memory card. That would hold my entire portable library of downloaded PSP, PS1 and Vita games. I'm sure the price tag will send me screaming to the hills. Hmmmm, it may allow you to do that, Terry. At least, I can't say that I know it *can't* do it. I do know you can use the Vita with the Vita TV in some form or fashion, but I'm not exactly sure how. Personally, I'd prefer a Vita with TV-out to the Vita TV, but since it seems Sony's not going to give that to us, I guess the only option is to get either a Vita, a Vita TV or both. Oh, and as for the 64GB memory cards: apparently the Japanese ones will cost about $100. Yikes! That's about what I paid for the 32GB, but the sticker shock was reduced because the Vita itself was paid for through a generous combo of birthday and Christmas money. I only had to buy the card. Unless you have a lot of downloadable games, a high-end card would be a waste. I was moving over my digital library of 30-40 PSP and PS1 titles, which eat up a lot of room. The darn proprietary memory cards are still a glaring obstacle for me, personally. If Sony announced SD compatibility, it would make any of the Vitas more desirable to me. I might get 2000 at some point since I don't mind the lower image quality. I find the 3DS's image quality just fine. And as others have said, the price for memory cards is a hurdle too me. Even the price of Nintendo's own 16GB 3DS SD card is less than half the price of a 16 GB Vita memory card on Amazon.com. I have proof of this too. 16 GB card specially designed for 3DS by Nintendo. I hear ya, 2D2Will. It's a sticking point for me, too. And, sadly, it'll be a sticking point when it comes to the PS Vita TV, too. Sigh. Yeah, it's kind of crazy that Sony went that route. Well, OK, so it's not entirely crazy, as it helps them make more money off of the Vita, but it's definitely crazy from a consumer standpoint. I have to say, the only thing that has me super interested in the 2000 are the colors! I'm reaaaally digging that light blue color. I don't want to sound elitist, though, but I really like the OLED screen, so I'd want to play one in person with the LCD screen first before even considering buying. That said, I don't think I really need another PS Vita! It's a great model for folks looking to pick up the system, though. You don't sound elitist, Anne. Also, I have a feeling it's easy for me to say I don't really care about the OLED screen when I've never experienced one in person. As for the Vita TV: yeah, that's going to be the issue, isn't it? If it only sells to people who don't yet own a Vita, I'm not sure how good the sales will be. Of course, the same could be said if it only sold to people who already own a Vita, couldn't it? It amazes me on how Sony is picking up its pace on targeting different kind of market...Should the device really charge the consumer for only USD 100++ I think people will start embracing the idea. I for one will definitely go for it.. Another thing is people had been complaining about the small screen and stuff.. So Sony tries to tap in these markets which holds many possibilities..
And that possibility will in turn bring more good news to us PSVita users, because more software sales means more investment from developers. Hence, we get more great games for PSVita! On to another topic, If the gaikai service is a success, I think Vita TV could be the future for gaming where you can stream games from PSOne all the way to PS4 just like what OnLive tries to do but fail.. Those games could be cheaper as well, given that more than half of the gamers starts going digital.. The price will not go as low as Steam Sale, still it is way lower than what we have.. It can even go much further say if Oculus is something people starts feeling comfortable to use and starts welcoming them, then Sony's head mount display, can be the TV you can continue your PS4 games with, using PSVita or you can stream it from your HMD. I mean, yea.. Way to go Sony! I really hope they can go forward with the technology.. I can't say I'm as optimistic about the Vita TV's future--or the Vita's future--as you are, but I do find the Vita TV interesting and I'm definitely contemplating buying one, assuming it's released in the US at a reasonable price and a good number of games are compatible with it. That said, I can't help but wonder how many people who are currently expressing interest in it are like me--contemplating it, but possibly never picking it up. We'll see, I guess. Regardless, I do hope this sort of move prompts Nintendo and Microsoft and others to think along similar lines and to continue to expand the idea of what gaming is and does. If that's all the Vita TV accomplishes, it will still be a success in my mind--even if it doesn't sell as well as you are envisioning.